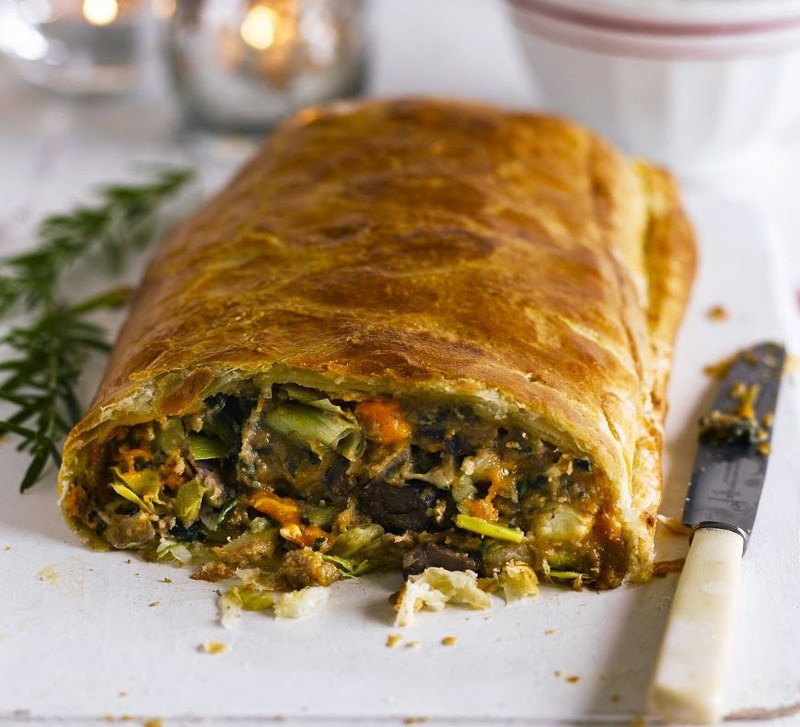 Mr Vegan's Neighborhood: Chestnut & Spinach en croute with Bleu Cheese~Open Fire Not Needed! Chestnut & Spinach en croute with Bleu Cheese~Open Fire Not Needed! ks and garlic, stir well, cover and cook for 10 mins until the leeks are soft, stirring a few times to check that they don’t catch. Tip into a large bowl. Put the spinach in the pan and allow it to wilt. Leave to cool and, when cold, squeeze out as much liquid from it as you possibly can. Tip the chestnut purée into the bowl with the leeks and add the 3 eggs, the nutmeg, chestnuts, spinach, breadcrumbs, cheese and seasoning, and stir until well mixed. Chill for at least 1 hr until the mixture firms up. Heat oven to 220C/200C fan/gas 7. On a lightly floured work surface, roll out the pastry to a rectangle large enough to completely enclose the filling. Carefully lift onto a large, long baking tray that has been lined with baking parchment, then brush round all the edges of the pastry with the remaining egg. Spoon the filling down the centre of the length of the pastry, leaving the ends clear. Tuck the ends over the filling, then firmly lift up the sides to wrap them round, trimming away any excess pastry as you go. Brush with more egg to glaze, then make a few holes in the top so steam can escape as it cooks. Bake for 40 mins until golden and the filling is firm. Remove from the oven, brush with more glaze and bake for 10 mins more. To make the sauce, heat the stock in a medium pan, add the leeks, boil for 5 mins, then take off the heat and scoop out 2 tbsp of the leeks. Blitz the rest in the pan with the cornflour using a hand blender, then cook, stirring, until thickened. Pour in the cream and reserved leeks and warm through. Can be made 2 days ahead and chilled. Serve the pastry in thick slices with the sauce. Say Hello to Your Little Gnome.. Shake it up with these "Cozy Owls"
Spice Up Your Vegan Lunch With Pepper... Sergeant Pepper, That Is! Grow your own Chocolate Pepper! ***Click here to buy*** Chocolate Habanero Pepper - All-included-planter-kit . Just Add Water. Digital 2-Tier Veggie Steamer on Xanaland! Grow your own Cherry Peppers! Cherry Pepper All-included-Planter Kit ...Just Open..water the seeds...watch It Grow!!! Natural Beauty = Medium Gorgeous on Xanaland! Grow ch-ch-chives (and more) with Ch-Ch-Ch-Chia! Makes a great gift. The Vegan Girl's Guide to Life. Buy it for girls AND boys! Purple Majesty - Sage, Cedar, and French Lavender - 9 Inch Smudge Stick From Native Scents - Click Here To Buy! Have Sparkly Teeth Like Sancho! Plant a Full Acre Crisis Victory Garden - Click Here To Buy! There are Purple Carrots on Xanaland! 500 Seeds, Carrot "Cosmic Purple" (Daucus carota) Seeds By Seed Needs - Click Here To Buy! Awesome Inc. theme. Theme images by stellalevi. Powered by Blogger.